Welcome back! 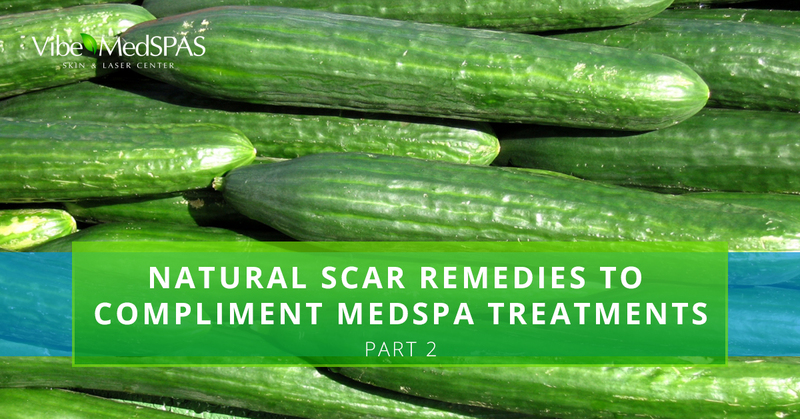 In part one of our two-part blog series, we began looking at some natural topical treatments for treating facial scars. Some of the topical solutions we looked at included apple cider vinegar, aloe vera, and raw, organic cocoa butter and coconut oil. Not only can these treatments minimize the appearance of scarring, they can also ease redness, itch, dryness, and swelling. Topical treatments like these also work well as a self-care treatment in conjunction with the skin care treatments and laser therapy sessions with us at your local medical spa in Scottsdale. Let’s take a look at few more of the natural scar treatments below. Silicone gel sheets can significantly reduce the formation of scarring after surgical and cosmetic surgery procedures. These sticky gel pads are similar to band-aids and are ideal for use during surgery recovery, as they can greatly speed up the healing process. While using these sheets on the face can be a bit uncomfortable when worn in public, they are great for wearing at home to treat scars. They can alleviate swelling and inflammation and reduce redness and itch, all while healing your wound to reduce scarring. Cucumbers are packed with vitamin A and other nutrients that can stimulate collagen production and alleviate swelling. This juicy veggie can be used in its raw form and placed on scars to alleviate the appearance of damaged tissues, or it can be puréed to make a healing mask that can soothe and smooth facial scars while also reducing their appearance. Essential oils hold many healing properties that can assist with reducing the appearance and discomfort of facial scars. Tea tree oil is an antiseptic that can effectively treat acne breakouts and heal acne scars. Lavender oil has been used for centuries by healers to ease pain and alleviate swelling. It can also reduce facial scarring as it heals your damaged tissue. Try mixing tea tree oil or lavender oil with coconut oil, another beneficial scar treatment, and apply this mixture to your scars one to three times a day to help diminish scars. Caring for your scars at home is essential for proper healing. These natural topical treatments can reduce the appearance of facial scars caused by acne, cuts, lacerations, scrapes, and surgical procedures. For highly effective scar reduction, and to see more immediate results, call Vibe MedSpa to book an appointment for one of our scar-reducing skin care treatments and/or laser therapy treatments. As the Top Rated Local® medical spa in Scottsdale, we’re dedicated to enhancing your natural beauty by improving your skin’s texture and radiance.